NRA, Newport Fleet: Capt. Norcross Visit. When in the course of running events it becomes convenient for members of one club to dissolve the bands which have connected them to another…. 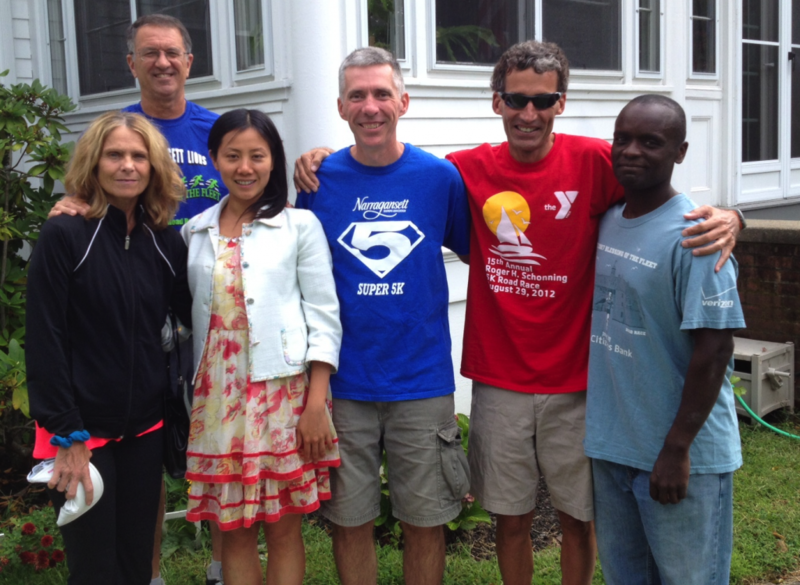 The Newport Fleet of the Narragansett Running Association consists largely of members of the Newport Running Club, which now exists largely as organizers of the Newport Pie Run (which donates generously to local charities, including our own Youth Track Series). Among these islanders are some of our most enthusiastic and loyal members, and we thank them for their service and friendship. Pictured below are six such fleetmates, five of them fresh from a run and visiting Capt. Norcross (Super 5K Shirt) at his quarters. Our ties to the Newport Fleet are strengthened by occasional group runs in Jamestown or Newport. Thus, if you plan a run in Jamestown or Newport, please post it to the email list for all to see.